Use Case: You have repository corruption that can not be fixed using consistency check and fix. 5) Use command g! "login admin <admin password>"
6) Use command "rm [<UUID of Node you are having Problem in above stack trace it is 795cff24-7fd7-3f5f-a9b1-4724c3a6ff4d>]" then use command "save"
Above output shows node is pointing to orphan node, Which can not be fixed by consistency check and fix. Use help command to find things that you can do with gogo shell. 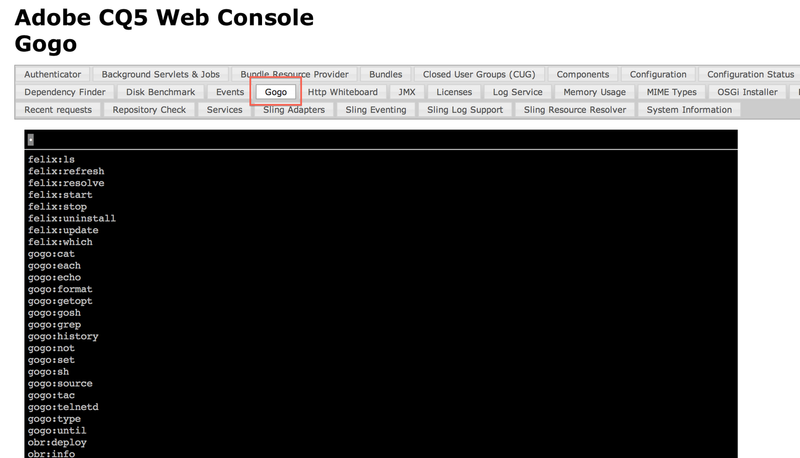 Caution: gogo shell (Similar to crx console in earlier version) is very powerful tool and cause system damage as well. Please use this tool with care. Let me know if you want detail about any command in gogo shell. I am seeing these errors on a brand new cluster set-up by cloning the Master to create the slave. Should the above steps be followed? Hello I would suggest to create a daycare ticket to find out why this issue is coming. If you are seeing this error in master as well then you might have to first fix it in master using instruction above and then start slave. Thanks Yogesh. I did raise a ticket with Adobe and it was resolved. Recreating slave from Master clone helped resolve the issue. Mentioned your blog and the person I spoke to was full of praise for you :) Thanks for your help to CQ community. I have installed the jars using using felix console(http://localhost:4502/system/console/bundles).I am able to use GOGO tab in the felix and also able to use help and lb commands but for all commands crx commands such as crx:help and login I am getting command not found. What happen when you run this command through GOGO shell in felix console it self ? Note that your CRX should be up in order for this command to run. Can you please provide your expertise?